1. the lysis and assimilation of a substance, as of bone. Alveolor Resorption of the alveolar bone in periodontitis. From Darby and Walsh, 1995. 1. The act of resorbing. 2. A loss of substance by lysis, or by physiologic or pathologic means. 1 the loss of substance or bone by physiological or pathological means, such as the reduction of the volume and size of the residual ridge of the mandible or maxillae. 2 the cementoclastic and dentinoclastic action that may occur on a tooth root. Also called external resorption or internal resorption. the taking back into an organism of any structure or secretion produced. Loss of substance by lysis, or by physiologic or pathologic means. n 1. loss of substance (bone) by physiologic or pathologic means; the reduction of the volume and size of the residual alveolar portion of the mandible or maxillae. n 2. the cementoclastic and dentinoclastic action that often takes place on the root of a replanted tooth. n dissolution of the apex of a tooth, resulting in a shortened, blunted root. n 1. destruction or solution of the elements of bone. n 2. loss of bone resulting from the activity of multinucleated giant cells, the osteoclasts, which are noted in irregular concavities on the periphery of the bone (Howship's lacunae). Severe bone resorption in the mandible. n destruction of cementum by cementoclastic action. Noted as the presence of irregular concavities in the cemental surfaces. n osteoclastic resorption of alveolar bone (lamina dura) by multinucleated cells on the osseous margin adjacent to the periodontal ligament. n a pattern of bone resorption in marginal periodontitis in which the marginal crest of the alveolar bone between adjacent teeth remains level; in these instances the bases of the periodontal pockets are supracrestal; a pattern of bone loss in which the crestal margins of the alveolar bone are resorbed. 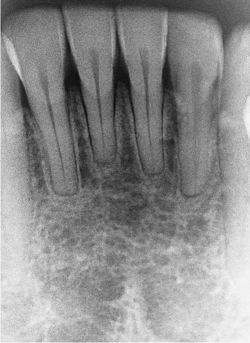 A horizontal pattern, rather than vertical loss along the root, is the typical type of bone loss in periodontitis. 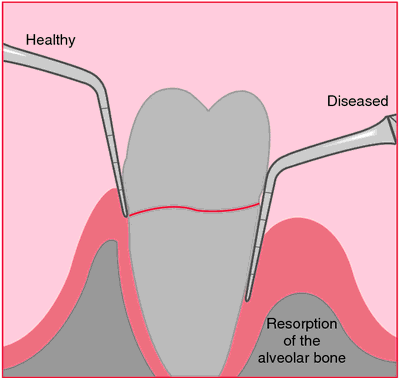 n resorption that is not attributable to any known disease or is without an apparent cause. 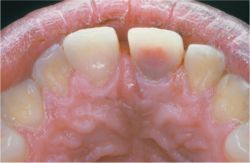 n (idiopathic internal resorption, pink tooth), a special form of idiopathic root resorption from within the pulp cavity; granulation tissue is present within the tooth, apparently with the resportion of the dentin occurring from the inside outward. The cause is unknown. n loss of bone by cellular activity; osteoclasts are large, multinucleated cells seen in irregular concavities in the margin of the bone (Howship's lacunae) and currently believed to be directly responsible for the active destruction of bone. n osteoclastic destruction of bone resulting from the application of sustained, excessive force. Remodeling of bone may occur to better adapt to these forces, or destruction may continue if the stresses are repeated and excessive. n destruction of the cementum or dentin by cementoclastic or osteoclastic activity. n localized resorptive areas on the cemental surface of the tooth root. n indirect, as opposed to frontal, removal of alveolar bone where pressure applied to a tooth has resulted in loss of vitality of localized areas of the periodontal ligament. 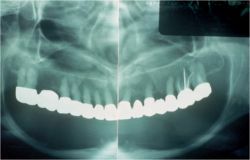 n a pattern of bone loss seen in occlusal traumatism, marginal periodontitis, periodontosis, and other conditions; a pattern of bone loss in which the alveolar bone adjacent to a tooth is destroyed without simultaneous crestal loss, so that a vertical rather than a horizontal pattern of loss is observed. 1. the lysis and assimilation of a substance, as of bone or fetus. while bones are being formed for the first time the sequence is formation followed by resorption and modeling; in remodeling of an existing bone resorption occurs first and is then followed by bone formation. concavities in bone created by osteoclasts. a continuous series of resoption lacunae.